The First of Many For Mark Selby? It has been a long road to the World Championship title for Mark Selby since turning professional back in 1999, but following his well-deserved victory against Ronnie O’Sullivan, one of my first thoughts was to wonder what the impact of this success will be on the remainder of his career. 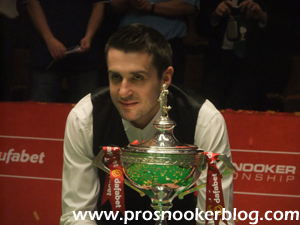 Having previously won three Masters titles and the UK Championship, as well as held the world number one ranking, victory at Crucible was by his own admission the big target for him and now that he has achieved that, will the floodgates open for Selby to enjoy a sustained period of success going forward? Back at world number one (where incidentally he has finished the season for a third successive year) and having looked at the Crucible to have been playing as well as he has for two or three years, it is hard not to imagine that he will continue to be among the silverware during the coming seasons. And of course 11 months from now, the speculation can begin as to whether he will become the first player to be able to break the ‘Crucible Curse’ and be able to successfully defend his maiden world title at the first attempt. While the post-final headlines understandably centred around how tournament favourite Ronnie O’Sullivan had let slip a 10-5 lead and lost at the Crucible for the first time since 2011, what was perhaps lost was just how well he accepted defeat to Selby. 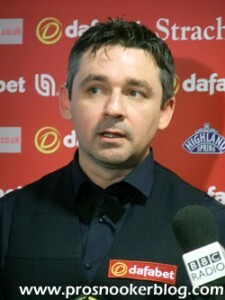 I recall someone making a comment that although he couldn’t win this time around, perhaps the biggest success of Ronnie’s psychologist Steve Peters this tournament was how O’Sullivan spoke after the match, both to Hazel Irvine in the arena and in his press conference shortly after. In years gone by, it is not difficult to imagine Ronnie being quicker to focus on his own performance and for example to hint at retirement as he has in the past, but this time there was nothing of the sort. 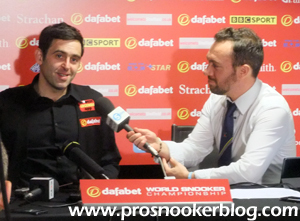 Indeed throughout the tournament after each round, the story of O’Sullivan’s press conferences is that there was no story. He spoke well and win or lose, seems to be in as good a place as he has been in for many years, if ever, and sought to take nothing away from Selby’s performance. Having seen his winning run in Crucible finals come to an end, it will be interesting to see whether his defeat will have any wider implications for Ronnie going forward. Will there be any extra seeds of doubt in his mind the next time he is able to make it to a World Championship final, or the next time that he plays Selby? Make no mistake, O’Sullivan remains one of, if not the man to beat at the majors, but Selby’s victory (and to a lesser extent Joe Perry’s performance earlier in the tournament), is a timely reminder to both Ronnie and the rest of the field that he can be beaten. Though he was to come up just short during his epic semi-final match with Mark Selby, Neil Robertson was of course successful in becoming the first player to make 100 century breaks during a single professional season, something that was clearly hugely important to him and of course shattering the record of 61 previously set by Judd Trump last season. I must admit that while I could see that what Robertson has achieved this season was a brilliant achievement, I had been guilty of underestimating what reaching 100 would mean to him. 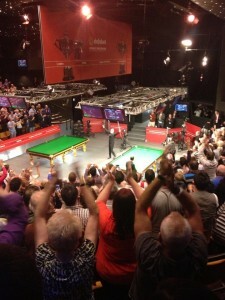 His celebration as he potted the final green to complete the feat made the achievement clear however and the way that the crowd reacted was incredible, I can’t ever remember witnessing an atmosphere quite like that at the Crucible before. It is then disappointing to see people attempting to detract from his achievement, rather than celebrate it, for example citing the increased number of tournaments in recent seasons and that there have been instances in the past where players have had slightly better ‘centuries to frames’ ratios in years gone by. Personally, I couldn’t disagree more. To me while others could have or would have done it in the past, ultimately the most important fact is that Robertson has done it.. To have maintained the level of scoring consistency that he has, from tournament to tournament with no discernible dips across effectively 11 months is hugely impressive and deserves respect. I have no doubt that the likes of Stephen Hendry and Ronnie O’Sullivan in the past might have been able to do it with more tournaments, but they didn’t and the fact that Robertson has almost double the amount of centuries of the next man on this season’s list is a measure of just how heavily he has scored. Though the bar has now been raised on a few occasions during recent seasons, I think that Robertson’s record will stand now for a long time before anybody comes close to breaking it. 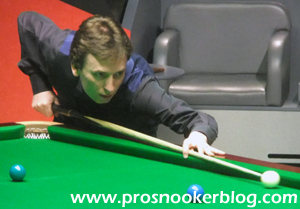 One of the strongest themes for me this tournament was the performance of some of the game’s more senior players, with the likes of Alan McManus, Dominic Dale and Ken Doherty all rolling back the years to record their best Crucible results in many a year in 2014. 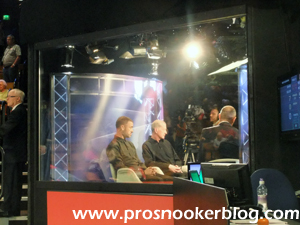 I am going to blog on the ‘age’ debate in snooker in a little more depth during the coming days, but for now it is fair to say that the forty-somethings continue to have a place in the game and with many of the sports higher ranked players now in their mid to late thirties, it is a trend that I can only see continuing in the short to medium term. As somebody who grew up watching the sport in the late 1990’s, it was enjoyable to see those players mentioned above not only showing that they can still perform, but to see how much each of them clearly appreciated every moment of being part of the tournament. 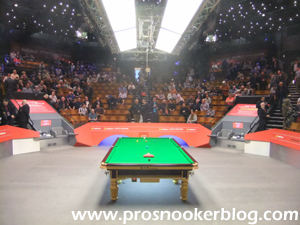 As much as I enjoyed being at the Crucible in 2012 and 2013, for me this year’s tournament was the best since 2011 and right up there with the best that I have attended since my first trip back in 2005. 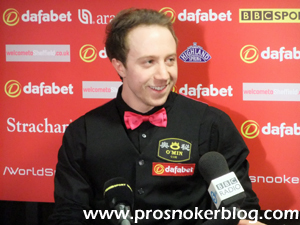 While there are a few reasons for that, the primary one was that although there were upsets early on, notably Michael Wasley’s sensational victory against Ding Junhui, in the main it was the world’s higher ranked players who made it through to the latter stages. Indeed, by the time of the quarter-finals, the field still comprised six of the top seven players on the money list, Ding being the notable exception. While the shock exits that we have seen in recent years are obviously great stories in the short-term and it is always good to see a few upsets, there is a lot to be said for having a good quota of the top ranked players making it through to the second week. 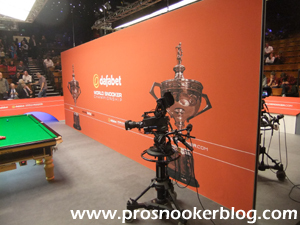 The semi-final match between Selby and Robertson was one of the best that I have watched at the Crucible, while the Robertson v Trump and of course the final were also captivating to watch. For all of the talk of burn out that we had in 2013 and again in the build up to this event, there was little evidence of that this time, with Selby and Robertson among those to produce their best snooker, notwithstanding their busy seasons overall. There was again a new sponsor for the World Championship in 2014, with Dafabet taking over from Betfair this year. Opinions were divided as to the colour of the carpet as ever, but generally the new colour scheme was warmly received and personally I much preferred it to the yellow of the previous sponsor. Perhaps the most noticeable aspect of the new sponsor from a media point of view was the absence of a physical presence on site throughout the event backstage. Both Betfair and in particular Betfred had somebody in the media room every week, providing the latest odds, offers and other features, but Dafabet were conspicuous by their absence. 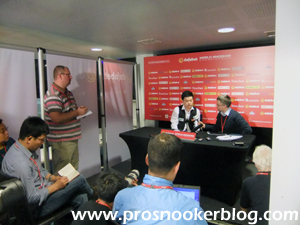 I am not sure whether it was a similar story up in the public area outside of the arena itself, but the days of Betfred handing out banners and free t-shirts, as well as going the extra mile by filming press conferences and daily reports to add to the snooker vibe are definitely missed. One of the downsides to attending the tournament for the full 17 days is that it is more difficult for me to get a feel for how the tournament is being covered on television, notably by the BBC, whose coverage is being watched by those of you here in the UK. This year however, owing to a few late starts, I was able to catch some of the action on TV and I definitely got the feeling that there was more live coverage this year, particularly of the morning sessions. While there were of course the usual instances of the BBC cutting away from the action at crucial times to show other programmes (Eggheads the most regular offender this year), it should be noted that this is not the decision of the production team on site, who do an excellent job of bringing the event to those of you at home. Still, the scheduling issue was something not lost on Barry Hearn, who took the opportunity at one of his press conferences to demonstrate to snooker fans that he is aware of the unhappiness at times and would be looking to speak to the BBC about such occurrences going forward. Perhaps the most notable talking point aside from the scheduling was the new arena studio, taking the place of the photography box on ‘table 1’ for the last five days. Personally I didn’t feel that the cramped studio particularly added anything, indeed it felt somewhat awkward to watch the various former world champions in there sat on their mobile phones on Twitter whilst trying not to make eye contact with the players out in the arena. Having spoken about the presence of the sport’s senior players in the tournament, it should also not be forgotten that in the main, there were impressive performances from this year’s four debutants. Most obvious of course was Michael Wasley, who produced a fabulous performance, particularly from 9-8 down, to cause one of the biggest ever Crucible shocks and defeat Ding Junhui, but there were also strong efforts from Xiao Guodong and Kyren Wilson, against experienced opposition here at the Crucible. It will be interesting to see next season how many debutants we will see under the new structure for the World Championship qualifiers, requiring everyone outside of the top 16 to win three matches if they are to appear at the Crucible. Staying with the qualifiers, with the early rounds of the tournament taking place ever-closer to the final stages of the event at the Crucible, one statistic that occurred to me during the tournament was that the man who has played the most matches during the event is not winner Mark Selby, but qualifier Alan McManus. Having won three matches to qualify, before playing a further three at the venue stages just to get to the quarter-finals, it begs the question as to whether a qualifier will be able to emulate the likes of Shaun Murphy, Mark Selby and Graeme Dott in recent years to reach the final. The tournament is often described as a 17 day ‘marathon of the mind’ but for the qualifiers, it is effectively a month long event now and the mental reserves required to win greater than ever. Will we see a qualifier reach the final again here? As well as the BBC, it was nice to see Eurosport on site for the final five days of the tournament, Dave Hendon, Joe Johnson, Philip Studd and Mike Hallett taking up residence of the spare commentary box to cover the event from the venue for the first time. Knowing how much more of a feel for what is going on out in the arena you get from actually being there, as well as the other stories that they would have heard in the media room itself, I know that this will have only benefited their coverage further. Also, a word for the decision to sell the tickets for next year’s tournament on the morning immediately after this season’s final, which has proven controversial amongst the regular visitors to the Crucible. While understandable that World Snooker would like to cash in on the current level of interest and attention generated by this year’s World Championship, there was clearly frustration amongst some of the people that I had spoken in Sheffield for this year’s event that they had to spend so much money, this early, for the 2015 tournament. Still, it could be worse, the few remaining season ticket holders had to stump up their cash before the qualifiers had even finished at Ponds Forge! So there we go, it has been another excellent tournament, up there alongside 2005 and 2011 as one of my personal favourites, with plenty of deciders and close matches throughout the event. Again I have to say thank you to World Snooker for allowing me backstage and into the media room, with the usual mix of written press, radio, bloggers and photographers all helping each other to bring you at home the very best coverage from snooker’s greatest show. Only another 11 months until we get to do it all again, though there will be a lot of snooker played and stories to cover between now and then!